Via iPhone – Today, 15 September 2012, the Valpinçon & de Launay family gathered once again at the former family chateau in Ménil-Hubert-en-Exmes, in Normandie, and now a famous France historic landmark. Once a year the Museums, gardens, and historic landmarks of France open free to the public. Since the former family Chateau is a private residence, it is only open during this one weekend a year. In July of this year, I had the pleasure of a private tour from the current owner, so we decided to return again today so my wife and daughter could visit the private grounds. First purchased by my 2nd great-grand uncle, Augustin René Valpinçon in December 1822 from Comte La Pallu, it was eventually inherited by his grandson, Paul Valpinçon, the lifelong friend of Edgar Degas. The Valpinçon Chateau remained in the family until 1974 when it was finally sold. Degas and Paul Valpinçon, were both born in Paris in 1834, and were schooled together in Paris at the famous Lycée Louis Le Grand. Degas visited the Valpinçon chateau at least as early as 1867 and included the interior of the chateau in several paintings, which included basic interior paintings and portraits of Paul, Paul’s wife, Marguerite, and daughter, Hortense. Degas would visit the Chateau until his death. One Degas painting, entitled “At the Races”, was a painting of Paul Valpinçon, Marguerite, an unnamed nanny, and Paul’s son Henri. It was painted at Haras du Pin, where horse racing still takes place today. What the art world did not know until made public by MyFamilyJules.com was the family relationship between Paul Valpinçon and Gustave Caillebotte – who were 3rd cousins via their respective fathers, and at one time lived only 3 blocks from one another in Paris. More history about the Valpinçon Chateau will be published in the future when I am not limited by my thumbs. Written on my iPhone. Please forgive any errors. We arrived in Paris from Nice, France after a 10-Hour drive to spend Thursday night with Valpinçon descendants. Departing Friday morning at 10am we stopped by Notre Dame to pick up copies of Valpinçon and Caillebotte family records which I had arranged to have ready and waiting for us. Afterwards, we stopped by another church in the 1st Arrondissement where I had previously discovered Caillebotte and Féron baptism records. It was nearly noon on the day before Bastille Day, and the church was about to close, but I was able to find a very busy Veronique, the church secretary who had helped me before, who remembered me from my visit this past May, and was quite happy to help me again. With Baptism dates in hand, we found finally found evidence of Veronique PINSON de VALPINÇON, the sister of Gabriel, Jacques, Anne (grandmother of Alfred Caillebotte), Victor, Augustin René (grandfather of Paul de Valpinçon who was the friend of Degas), Marie (my 2nd great-grandmother), Adelaide, and Jean Baptiste. In a few hours the current owners of the Chateau Menil-Hubert will give us a private tour of the family chateau where Edgar Degas kept a studio. This chateau first purchased by Augustin Renè PINSON DE VALPINÇON on 31 Dec 1822 from Dame Marguerite Charlotte Fanny de LA PALLU for 315,560 francs. The current value is estimated around €10 million. Palace of Monaco Hides Connection Between Families in Plain Sight. It’s funny what you come across, when you aren’t even looking. Yesterday, while visiting the Throne Room in the Palace of Prince Albert II, the reigning Sovereign Prince of Monaco (Albert Alexandre Louis Pierre Grimaldi), I happened to notice a painting of of his great-grandfather, Prince Albert I, hanging to the left of the throne. 1894 painting of Prince Albert I, by Léon Bonnat, shown to the left of the Palace throne. The 1894 painting of Prince Albert I is by Léon Bonnat. Bonnat was not only a teacher of my grandfather, Paul de Launay (a Valpinçon descendant through his paternal grandmother, Marie de Valpinçon) while he was at the Luxembourg, but was a teacher of his cousin Gustave Caillebotte as well. Paul de Valpinçon was a cousin of both Caillebotte and de Launay. Paul de Valpinçon’s lifelong friend, Edgar Degas, was also a student of Bonnat. Paul de Valpinçon and Gustave Caillebotte died in 1894, the same year as this painting. 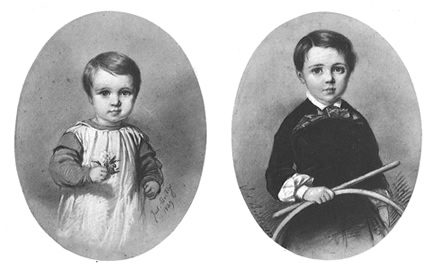 Gustave Caillebotte as a child. , because of the large number of Caillebotte fans that are blogging and re-blogging posts about our cousin, Gustave Caillebotte. By doing so, we hope to reach more fans, to share with them the not-so-public and private information about the life and family connections of Gustave that made him such a unique figure in French art history. Follow our Tumblr blog at http://www.CaillebotteFamily.com . Also please take a moment to LIKE a new page on Facebook, the Friends of Caillebotte, a new group that has hopes of helping to fund the restoration of former properties owned or occupied by Gustave Caillebotte that have fallen on hard times and are beginning to show major problems, such at the property in Yerres. You can find the Friends of Caillebotte at http://www.facebook.com/CaillebotteSociety. 6 Feb 2011 – on my break during my flight to Athens. What I find important in this passage entitled “Notes from Paris” is Jules mention of his cousin “Fourchy”. In 1849, there is also an “Antoine Jules Fourchy” listed as a witness attending the marriage of “Benoit Jacques Polinice Pinçon de Valpinçon” on Appendix A76 in Vol. 1 of the same series. His occupation was listed as “notary”, and may be the same “cousin” Fourchy whom Jules refers to in September 1880. The only other Fourchy I have found in our tree thus far is Jacques Fourchy (no dates), the husband of Hortense Valpinçon (died 1946). She is the same Hortense painted by Edgar Degas in 1869-1870 as a young girl. I cannot determine who the Fourchy cousin is for certain, or how he might be related. I suspect he is the husband of a Valpinçon daughter, and hope that my cousin Philippe Valpinçon in Normandy may lead me in the right direction, if I am unable to find a historical record of the names of the Advocats General of Paris. 6 février 2011 – sur ma pause lors de mon vol pour Athènes. Ce que je trouve important dans ce passage intitulé «Notes de Paris” est Jules mention de son cousin “Fourchy”. En 1849, il ya aussi une “Antoine Jules Fourchy” répertorié comme un témoin comparaissant le mariage de “Benoit Jacques Polinice Pinçon Valpinçon de” l’Annexe A76 dans le vol. 1 de la même série. Son occupation a été répertorié comme «notaire», et peut être le même “cousin” Fourchy qui se réfère à Jules en Septembre 1880. Le seul autre Fourchy J’ai trouvé dans notre arbre est à ce jour Jacques Fourchy (aucune date), le mari d’Hortense Valpinçon (mort en 1946). 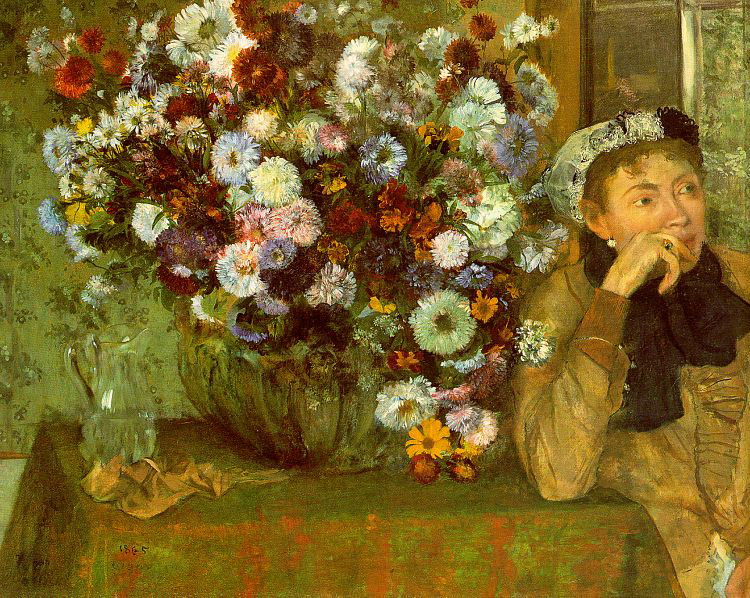 Elle est la même Hortense peint par Edgar Degas en 1869-1870 comme une jeune fille. Je ne peux pas déterminer qui est le cousin Fourchy est pour certains, ou comment il pourrait être lié. Je pense qu’il est le mari d’une fille Valpinçon, et j’espère que mon cousin Philippe Valpinçon en Normandie peut me conduire dans la bonne direction, si je suis incapable de trouver un historique des noms de l’Assemblée générale Advocats de Paris. I have been corresponding with someone named “Mio” from Japan who is apparently a fan of my cousin Gustave Caillebotte and operates the web site: http://www.Caillebotte.net. I found an unusually accurate genealogy there. I say unusually, because from my own research, I have not found anyone other that this to have such information that generally only families are privy too. After some back-and-forth emails over the past several months, I finally got the source of the information: Jean Pierre Toussaint. Mio wrote, “He is not a cousin though he has a passion for Caillebotte. He lives in Yerres and works for the Caillebotte Park there.” Mio said that he may have gotten the tree information from someone else who works there or from a French book called “Dessins et Pastels” which Jean Pierre said he had. I wrote Jean Pierre today and hope to hear back from him soon. J’ai correspondu avec quelqu’un du nom de «Mio» en provenance du Japon qui est apparemment un fan de Gustave Caillebotte et exploite le site Web: Caillebotte.net. J’ai trouvé une généalogie inhabituellement précises là-bas. Je dis exceptionnellement, parce que de mes propres recherches, je n’ai pas trouvé quelqu’un d’autre que ce à disposer de ces informations que les familles en général seulement sont au courant aussi. Après quelques emails de va-et-vient au cours des derniers mois, j’ai finalement obtenu la source de l’information: Jean Pierre Toussaint. Mio a écrit, “Il n’est pas un cousin mais il a une passion pour Caillebotte. Il vit et travaille à Yerres pour le parc Caillebotte là-bas. “Mio dit qu’il peut avoir obtenu l’information sur les arbres d’une autre personne qui y travaille ou d’un livre français intitulé « Dessins et Pastels “que Jean Pierre a dit qu’il avait. J’ai écrit Jean Pierre aujourd’hui et j’espère avoir des nouvelles de lui bientôt.